The time to prepare for a crisis is not when you’re in the middle of one. I’m sure you’ve heard the saying, “preparation time is not lost time.” Having a solid plan in place can go a long way in helping districts and schools prevent and respond as needed to crisis situations that arise. Learning environments where students feel safe, secure, and supported are the environments where students are able to achieve to their highest potential. Students should never be fearful of going to school. How can children learn and expect to succeed when they feel unsafe, physically or emotionally? Student safety and security should always be a high priority. School board members and administrators can provide safe and secure school environments with well-thought-out policies that directly address safety and security concerns. These policies can extend beyond safety in schools and classrooms to also include safety in social media. Informing and educating everyone within the district on his or her role in the case of a crisis or emergency is important. Planned emergency drills once a year should happen, but that may not be enough. Those district-wide emergency plans we are required to have in place can look good on paper. But, I ask you to look closely at those plans and policies to make sure they still work in today’s environment. What worked well even just a couple of years ago may not be the most effective practice now. I never thought I would see the day when security guards walked the halls of so many schools. As a child growing up, I never saw law enforcement or security guards in public schools. I even walked to class alone with my arms loaded down with books. I never felt vulnerable or unprotected. However, today’s environment is a changing one. The signs of the time should make us even more aware of the need to be better prepared now, before a crisis happens. Let’s continue the commitment of protecting children and providing safe and secure on- and offline environments that are conducive to learning. Make safety and security a high priority in your district. It’s an investment in protecting our students -- who depend on us to always do what’s best for them. 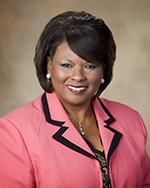 Miranda Beard (mirandabeard1@icloud.com) is NSBA’s 2016-17 president and a member of Mississippi’s Laurel School Board. Read about Beard's involvement with the Stand Up 4 Public Schools campaign in the August 2016 Q&A.